World 1-2 is the second course of World 1 in Super Mario Bros. 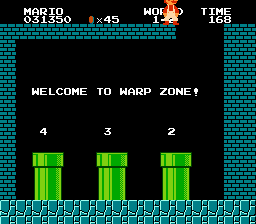 It is the first underground level, and it holds the first Warp Zone, which, if done correctly, the player can use to enter Minus World. 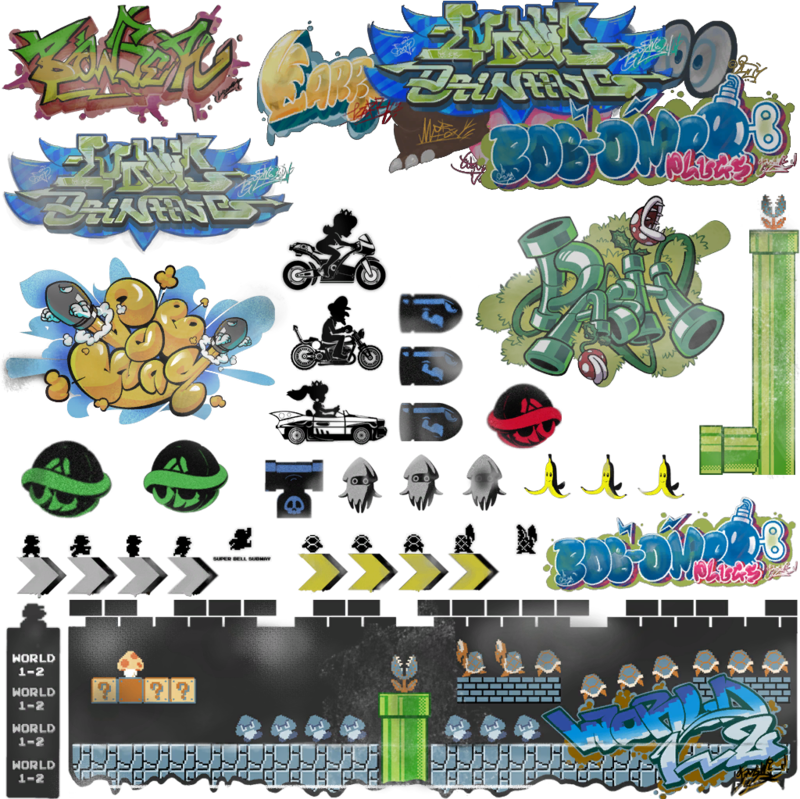 Like the previous level, this level has also been recreated in various games, including Super Mario Advance 4: Super Mario Bros. 3, New Super Mario Bros. 2 within the first course of the Gold Classics Pack, Super Paper Mario, and Super Smash Bros. Brawl as an alternate version of Mushroomy Kingdom. It set the precedent for most 2D Super Mario games to have the second level be an underground level. The player starts the level by falling through a hole in the roof by a pipe. There will be two Little Goombas and five ? Blocks. The first one contains a Magic Mushroom or Fire Flower, the other four ones contain coins. There will be a block tower structure, where there is a Little Goomba and a Brick Block with 10 coins. Ahead, there will be some Brick Blocks, one of them containing a Starman and some coins, with two Koopa Troopas underneath them. The player will reach a place filled with Brick Blocks with a Koopa Troopa and five Little Goombas. By breaking the Brick Blocks, the player can reach and walk across the top of the level. There will also be a Brick Block with a Magic Mushroom or Fire Flower and a masked Brick Block with ten coins. There will be a pit and, after it, a Block platform that allows the player to get a 1 up Mushroom. The player will find two Little Goombas and three pipes, all of them containing Piranha Plants. The player can enter in the first Pipe, that will lead them to a room with coins and a 10-Coin Brick Block. The player can exit the area by a Warp Pipe in the extreme right. This pipe will lead to the third one in the main area. There will be two gaps and, between them, two ground blocks and some Brick Blocks. After that, a small, half-pyramid structure with two Little Goombas is seen. Ahead, some lifts will be rising and falling; the first one moves down while the right one moves up. Between them is a platform with a Koopa Troopa and some Brick Blocks, with the final Brick Block on the right containing a power-up. The player will reach a Pipe that will lead them to the final area. They can use the lifts to reach a Warp Zone hidden through the roof. From right to left, the first pipe will head to World 2, the second one will lead to World 3, and the third one will lead to World 4. If the player goes through the regular level pipe, they will lead the player to a pipe with a Piranha Plant in an overworld area. There will be a Block half-pyramid that allows the player to jump on the top of the flagpole. In the 10-Coin block in the secret area through the Warp Pipe, which the player needs to collect all the coins from in order for the Red Coin to appear. The Warp Zone area at the end has also been changed, containing several Brick Blocks, a trio of ? 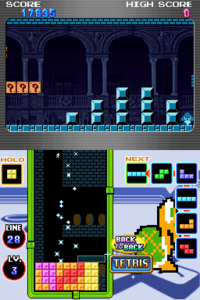 Blocks, several coins, and a power-up in a Brick Block before the pipe leading to the flag. In Mario Kart 8 and Mario Kart 8 Deluxe, there is graffitiMedia:MK8 dSBS Graffiti.png on the wall in Super Bell Subway that references World 1-2. This page was last edited on April 12, 2019, at 11:03.